Mayor Brown, Franchelle Hart, and Aaron Bartley. Can Diversity Pledge Help Change Buffalo's Workforce? 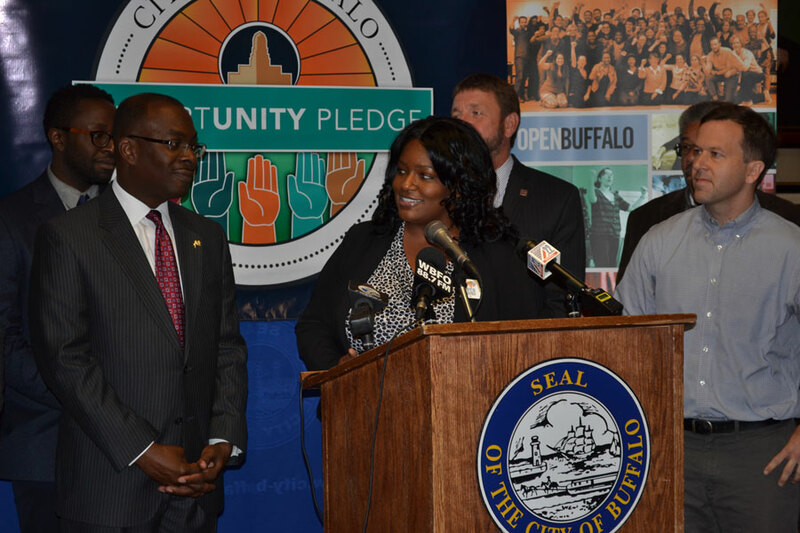 Mayor Byron Brown gathered with leadership from the social justice coalition Open Buffalo Monday to formally sign the group’s Opportunity Pledge, a commitment to expanding diversity and inclusiveness throughout Buffalo. The pact, which has been signed by nearly 3,200 individuals and more than 120 organizations, signifies a commitment to expanding diversity in institutions of power such as businesses and civic organizations. Brown, who noted that approximately $5.5 billion worth of development has come to the city since 2012, said it is important to make sure that people of all backgrounds are benefitting from the uptick in economic activity. “When you think of all of those new businesses, all of those new jobs being created, if all of that reflected the diversity of this community, think how much stronger Buffalo and Western New York would be,” he said. Despite recent economic development in the city and an unemployment rate the lowest it has been in a decade, Buffalo continues to rank among the poorest in the nation. Franchelle Hart, the executive director of Open Buffalo, said systemic racism and sexism has marginalized minority groups by denying them paths to prosperity and power. Part of Open Buffalo’s strategy is to push for community benefit agreements on major development projects that use public money. The diversity hiring goals in those agreements, however, are not quotas and are unenforceable, with developers often falling short of the mark. While Gov. Andrew Cuomo and other elected officials have touted the governor’s Buffalo Billion initiative as reaching all corners of the Queen City, this promise has been called into question of late. Last week, the Investigative Post reported that diversity hiring numbers at the Solar City Riverbend manufacturing plant were quietly lowered from 25 percent to 15 percent, and that contractor LP Ciminelli has failed to meet even the reduced goal so far. Mayor Brown held a press conference later in the day, releasing the diversity hiring numbers for July, which show the total for diversity hiring in that month to be 18 percent and the total for the project to date to be 16 percent. The mayor, surrounded by minority workers employed at the site, said the numbers were now exceeding the goals, but failed to mention that they still fall short of those originally agreed upon in the land sale –numbers touted by Cuomo’s administration in a pair of press releases. Hart said her organization plans to focus on projects that agree to diversity hiring beforehand, in order to maintain some semblance of accountability for these projects, whether it embarrasses developers or not. Aaron Bartley, executive director of PUSH Buffalo, pointed to several community benefit agreements that have worked well to provide employment for people who often face barriers to quality jobs, highlighting Savarino Companies’ 500 Seneca project. The developer worked with PUSH Buffalo to provide job training on-site and hired mostly men of color to work well-paying jobs with health benefits. “We see the opportunity pledge as one measure of making transparent commitments that nonprofits and for-profit organizations have to those values,” Bartley said. 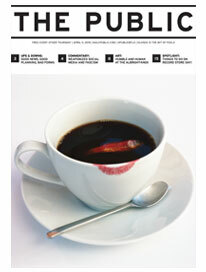 Justin Sondel appears via a content-sharing agreement with City & State.